A little bit late I know, but before we get too far into 2017 I really wanted to share a visual reminder of all the hooky that happened in the Attic during the past twelve months. I started 2016 with the tail end (literally) of my Sunny Log Cabin Crochet-A-Long - lots and lots of darning in ends and stitching those gorgeous big squares together. I enjoyed a beautifully vibrant and Sunny Ta-dah moment in mid January when my CAL came to an end and my five foot square blanket was finished. I decided to re-make my original Granny Stripe blanket at the start of 2016, changing the dimensions and adding an additional block of stripes. I started making my Cupcake blanket in February, using 15 shades of Stylecraft Special DK inspired by the pretty colours of iced cupcakes. A very pretty Cupcake Stripe Blanket Ta-dah! I started working on the new mascot sheep for Yarndale 2016. I made a string of Baby Bunting using leftovers from the cupcake blanket - another pattern/project that is on my to-do list to share with you very soon. I started obsessing about big mandalas again in April, using brightly coloured cottons to up-scale a thread doily pattern. ....here she is, looking beautiful on the Yarndale postcard. Colourful Spring Leaves flew off my hook in April - I made these to decorate the jug of twigs that sits on my mantel. I felt inspired to start making a Summer Wreath - I finished the stripy base but sadly didn't have time to make enough flowers to finish. Another project on my t0-do list for 2017. I made this little Little Mouse Wreath as a gift - you can read more about it here. I began a very colourful blanket to use up lots of scraps of Stylecraft Special DK. During the month of May I was obsessed with these granny squares! The Colourwash Granny Blanket is finished - Ta-dah! I designed a crochet pattern for Yarndale's Creative Community project - These Woolly Sheep were a tremendous success (the woolly sheep pattern is here, and more info about the charity project is here). I designed these Little Owls for the 2016 Yarndale brochure. More Baby Bunting triangles using up leftovers from the Granny Stripe re-make. More creative work for Yarndale as I designed and created the 2017 mascot sheep with help from my hooky Yarndale buddies. And here she is, gently grazing in her green field. We haven't named her yet.....any suggestions?? Behind the scenes, August was all about the heather here in the Attic as I started to design and sample for my Moorland Blanket. I completed my set of three Weekend Bags ready to launch the yarn packs at Yarndale. In October I wrote up a huge tutorial for this project and shared it all here on my blog. I completed two mandala hoops to be displayed as part of the yarn bombing at Yarndale - they looked amazing hanging from the tree branches! Still obsessed with the mandala hoops I couldn't resist making another one. I wrote up a mini how-to tutorial too, after so many people requested the information. The obsession continues as yet another giant mandala starts to take shape. This is still a WiP but very close to being finished. I made this cute piece of crochet to photograph for the cover of my Erin Condren Life Planner. You can read more about it here and find the pattern for the Flora Flowers here. This was a month of deadlines for me, as I worked away at a two very special design projects. I'm sworn to secrecy until next month, but I am very excited about them! For one of the projects I used some shades of Stylecraft Batik DK which was a dream to crochet with. The other secret squirrel design project called for some cotton yarn, and I had the exquisite pleasure of selecting colours from this box of cutesome mini 10g balls. Oh the joy! I started another stash-busting project, using colourful oddments of Stylecraft Special DK. This is the beginning of a cushion cover, using my Neat Wave pattern. Finally, after months of planning, I was thrilled to launch my Moorland Yarn Pack and introduce my latest Crochet-A-Long blanket project. I loved sharing this colourful Neat Wave cushion - Ta-dah! I worked hard creating a comprehensive tutorial for my Moorland Blanket, ready for my CAL to begin at the start of January. Lots of behind the scenes colour play and sampling as I worked on ideas inspired by these dried hydrangea flowers. I'll have a new blanket with some delicious yarn colours to share with you in the Spring. This is my eighth Crochet Review, and that thought both delights and surprises me - I mean, I know my blog is coming up to it's 9th Birthday, and yet in many ways it seems like hardly any time at all. I had in my mind to write more about my 2016 projects, but honestly, I don't think there is any need to waffle here. Just to say that I continue to feel an overwhelming passion for creating with yarn and colour, for hooking up projects to use, enjoy, share and inspire. Crochet is IT for me, it fills my world with love, joy and happiness. And yarn. Thank you so so much, from the bottom of my heart, for joining me on this journey, and here's hoping that 2017 will be magnificently creative and fulfilling for all of us. Have a happy hooky year! ps previous crochet reviews are in my archives if you wanted to go and pootle around a bit! I love everything, many thankx for all this stunning projects! Well, what a year you have had dear Lucy. I am grateful to you for sharing your delightful insights to life, family and doing what you really love. Thank you so much. I wish you and your family a safe and happy 2017. I have made a granny square blanket (first one ever) and used your cosy blanket edge to finish it off. I love it. I am also hooking your cosy stripe blanket using varigated wool...such fun. Your pattern is brilliant. Thank you. I am delighted you like hydrangas now..they are beautiful. Oh and one last thing... your little sheep....perhaps Nancy? I've been reading your blog from the US for a couple of years now. I am a knitter...crochet has ever been a mystery to me. However, one look at the Moorland blanket and I decided to learn. Last week I purchased an on-line class and learned the basic stitches. I still need to work on improving my technique (and figuring out how to avoid wrist pain!) but I am determined to make that blanket in 2017! Thanks for this blog! I look forward to reading it every time it pops up in my feed! Love seeing what you have done luck. Beautiful year in review!! Love these even though I read every post I forget all the wonderful things you make. Can't wait to meet you in September at Yarndale!! 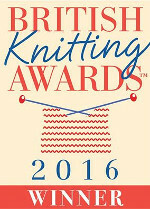 Looking forward to making whatever your project is for Yarndale. I think that Petunia would be a good name for your sheep!! Wow! What an inspiration. I love your creations. Please do a hooky book....not that I want to add to the pressure!! Looking forward to Yarndale 2017. What a feast for the eyes! You accomplished so much last year. Oh what a wondrous feast for the senses is your blog ALWAYS. I found your blog in 2011 when I was looking for instructions on how to join up granny squares!! I was delighted to find someone that loved colour as much as I do. I started crocheting like a demon for months, made a few blankets and throws and then stopped until now.... found you on FB and ordered the moorland pack, love the colours and your interpretation of the scenery around you. I'm trying to knit a cardigan using your colours and instructions, watch this space!! You're so inspirational and how you find the time.... as we Irish say "fair play to ya". Keep up the good work and thank you for sharing so much of what you obviously love. Patricia, Luachra Lodge BnB, Killarney. Love it, so much yummy colourful goodness. I think the yarndale 2017 sheep looks like a Molly to me. Lovely post, how inspiring to see a whole years work in one place. Lovely post, Lucy! Truly a visual feast, and I look forward to even more inspiration! It's amazing Lucy, what you make in one year. It's beautiful, colourful and just a feast for the eyes. Thank you for sharing! And a name for the Yarndale sheep: she looks like a Molly to me. So maybe Granny Molly? Happy 2017 to you Lucy! Grazing Grace or Granny Baaaaaa..arndale. What an amazing collection of work - fabulous - it leaves me just a little breathless! I will come back to read all the links later. Oh Lucy those hydrangea colours are enchanting - so looking forward to seeing your ideas for those. Thanks so much for sharing your creativity so generously. Your blog is a must for crocheters! With love from Leicestershire. What a delightful post, so many beautiful things all in one place. Well done to you. You made a lot of beautiful projects in 2016. I love all your blankets and your sheep looks adorable. My wish is to once go to Yarndale, but I don't know if my mom would be up for it. We live in the Netherlands so we would probably have to go by airplane and my mom doesn't like that so. But one day I'll go, I hope. Have a lovely 2017 Lucy and I'm looking forward to all your projects. I am in awe!!! You always make SO many pieces in 12 months, while I struggle to finish one!!! Well done! Mabel was the name that came to me. Many thanks for your wonderful inspiration and sharing.